Easter Triduum, Holy Triduum, Paschal Triduum, or The Three Days is the period of three days that begins with the liturgy on the evening of Holy Thursday and ends with evening prayer on Easter Sunday. It recalls the passion, death, burial, and resurrection of Jesus, as portrayed in the canonical Gospels. The Forty Days of Lent are a time of preparation for these great Three Days, which is what Triduum means. These three days lead us to an empty tomb and an Octave, eight days, of celebrating the Resurrection. They also introduce an entire liturgical season, the Easter Season, which lasts for fifty days until Pentecost. The Catechism of the Catholic Church instructs us: “Beginning with the Easter Triduum as its source of light, the new age of the Resurrection fills the whole liturgical year with its brilliance. Gradually, on either side of this source, the year is transfigured by the liturgy. It really is a ‘year of the Lord’s favor.’ The economy of salvation is at work within the framework of time, but since its fulfillment in the Passover of Jesus and the outpouring of the Holy Spirit, the culmination of history is anticipated ‘as a foretaste,’ and the kingdom of God enters into our time. Holy Thursday – Holy Thursday commemorates the Last Supper, where Christ lays out the model for the Eucharist or Holy Communion. During the meal, Jesus predicted the events that would immediately follow, including his betrayal, the denial of Peter, and his death and resurrection. Events of the last supper play varying roles on this day by commemorating the washing of the feet of parishioners by the celebrating priest. Good Friday – Good Friday commemorates the crucifixion of Jesus and his subsequent death. Commemorations are often solemn and mournful. Many denominations use Good Friday to perform the Stations of the Cross, or other commemorations of the Passion, either as a self-guided time of reflection and veneration or as a procession of statues or images of the stations. The evening liturgical celebration on Holy Thursday continues in an atmosphere of liturgical mourning throughout the next day in spite of the name “Good” given in English to this Friday. For Roman Catholic and Anglican Christians, Good Friday is a day of fasting. Western Catholic Church practice is to have only one full meal with, if needed, two small snacks that together do not make a full meal. Holy Saturday – Holy Saturday is the day between the crucifixion of Jesus and his resurrection. 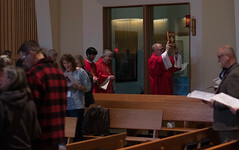 While daytime services or commemorations of the day are rare in the Western tradition, after sundown on Holy Saturday is the traditional time for the Easter Vigil. 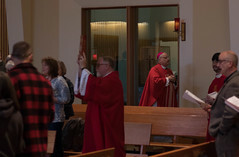 In the Catholic tradition, Mass is not celebrated on what is liturgically Holy Saturday. The celebration of Easter begins after sundown on what, though still Saturday in the civil calendar, is liturgically Easter Sunday. On Holy Saturday the Church waits at the Lord’s tomb in prayer and fasting, meditating on his Passion and Death and on his Descent into Hell, and awaiting his Resurrection. The Church abstains from the Sacrifice of the Mass, with the sacred table left bare, until after the solemn Vigil, that is, the anticipation by night of the Resurrection, when the time comes for paschal joys, the abundance of which overflows to occupy fifty days. The tabernacle is left empty and open. The lamp or candle usually situated next to the tabernacle denoting the Presence of Christ is put out, and the remaining Eucharistic Hosts consecrated on Holy Thursday are kept elsewhere, usually the sacristy, with a lamp or candle burning before it, so that, in cases of the danger of death, they may be given as viaticum.